As many of you know, my daughter, Annabelle, was born with a severe heart defect in 2010. Her exact defect is complicated, but to simplify, she had only half of a working heart and without intervention would have died within her first week to two weeks of life. My FIGHTER princess spent her first 308 days of life in the hospital. Her first open heart surgery was at 6 days old. Her second at three months. At six months of old, they informed us that their attempts to make her special heart work for her was failing, and she was dying. Her only chance at survival was a heart transplant. She waited in the pediatric ICU for three months before we received the call that a heart was ready for her. She came home for the first time in May 2011, and spent that summer in and out of the hospital, and her her first life flight ride in a helicopter when she almost died at home. Her course was not easy. She is one of the STRONGEST little girls I know. And we are determined to do what we can to help other babies that come after us with heart defects. 308 days in the hospital is WAY TOO LONG. Congenital Heart Defects are one of the leading causes of death in children. One in every 100 or so kiddos are born with one. On May 16th, our family is walking in the Nashville Congenital Heart Defect Walk to raise funds for both the Children’s Heart Foundation and the Adult Congenital Heart Association. We would be HONORED if you would help partner with us! I’ve shared the link to donate in previous posts… but TODAY ONLY I’m giving a unique way you can help! My most recent book, A Side of Hope, is the first book where I’ve incorporated just a little bit of Annabelle’s story. 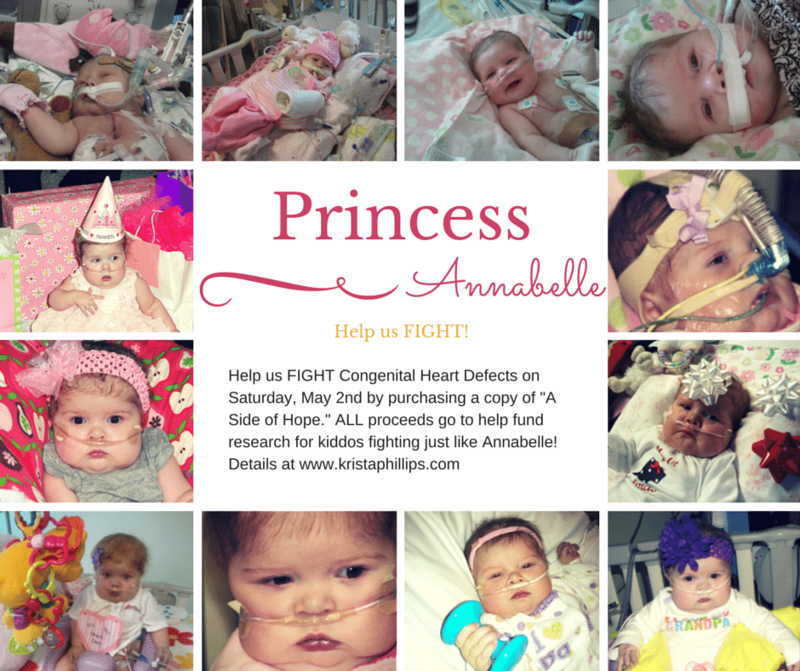 In honor of that, I decided to donate 100% of the profits from that book TODAY toward the TEAM PRINCESS ANNABELLE in the Nashville CHD Walk. You can purchase the book on Amazon, Barnes and Noble, or ibook. Thank you SO much for joining along side us in this journey! You can also still donate right up until event date at http://events.congenitalheartwalk.org/goto/kristaforannabelle ! Yay! I just bought it! I had a NICU baby too, so this is a great way to honor all the little fighters out there. Go Team Princess Anabelle!